Do These Eight April Fools' Pranks Make the Grade? 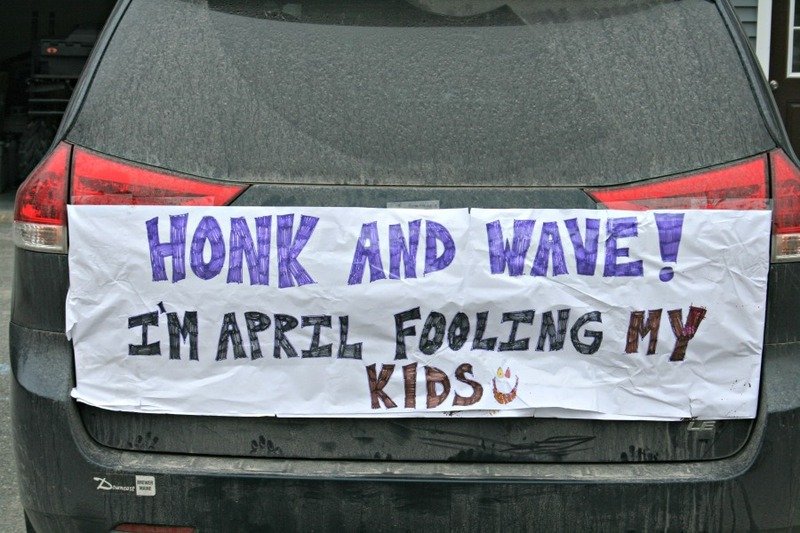 Do These April Fools’ Pranks Make the Grade? When it comes to making holidays ‘magical’ for my kids, I like to think I fall comfortably in the middle of the spectrum. And the ‘minor’ holidays? Well, those are mostly ignored. If we think of it, we’ll get the kids a big Hershey kiss for Valentine’s Day or give them a pinch on St. Patrick’s Day, but I’m not about to start dying my toilet water green or sprinkling glitter everywhere. There is, however, one minor holiday that I’ve adopted as my own personal favorite: April Fools’ Day. A few years ago I started playing April Fools’ pranks on the kids and now it’s become a tradition that we all look forward to. They not only love to be pranked; they’ve also started creating April Fools’ jokes to play on us. GUYS! EASTER IS ON APRIL FOOLS’ DAY THIS YEAR (2018)!! 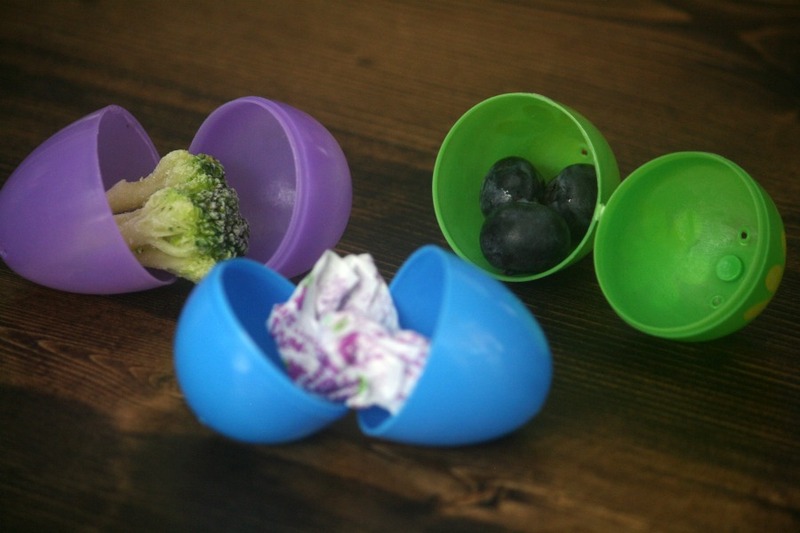 CLICK HERE FOR EASTER-SPECIFIC PRANKS like the one below! Each year I try out different pranks and record them here to let you know which ones work well and which ones don’t. That way, you can avoid the lemons and get right to the good stuff! This was the very first April Fools’ joke I ever played on my kids. They always drink orange juice in the morning, so this was the perfect prank for them. I made a batch of Jello after they went to bed, poured it into their juice cups, added straws, and put the cups in the refrigerator to set. In the morning when we came downstairs, they asked for their OJ, so I grabbed the cups, passed them out, and waited for the reactions. After one sip, Eli immediately knew what was up (we had talked about April Fools’ Day the day before) and responded with a laugh. Samuel and Annelise were not so quick to catch on. Annelise screeched in frustration and Samuel went from confused to frustrated to angry to tearful in less than a minute. He calmed down after I assured him that he would get real juice momentarily (he takes his juice drinking very seriously!). Grade: A+ The reactions were priceless! This is an easy prank to prepare for. All you do is stuff toilet paper into the toes of your kids shoes in hopes that they’ll think they’ve outgrown them over night. I casually mentioned to Eli in the morning that it looked like his feet were bigger. He agreed, saying they were “only a tiny bit bigger. 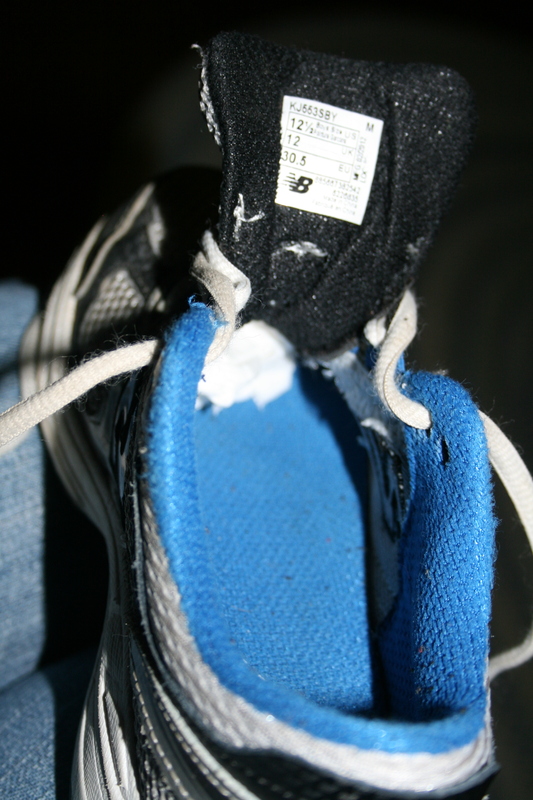 Maybe two inches.” When he went to put his shoes on, he got one foot partially in and said, “Hey, something’s in my shoe!” Bummer. It was the same way with Samuel. As soon as he started to shove his foot in, he knew something was in there. Grade: D- I either needed to mold the toilet paper better so that it felt like part of the shoe or perhaps this one was just a dud to begin with. I was excited about this one because it was aimed at my husband. 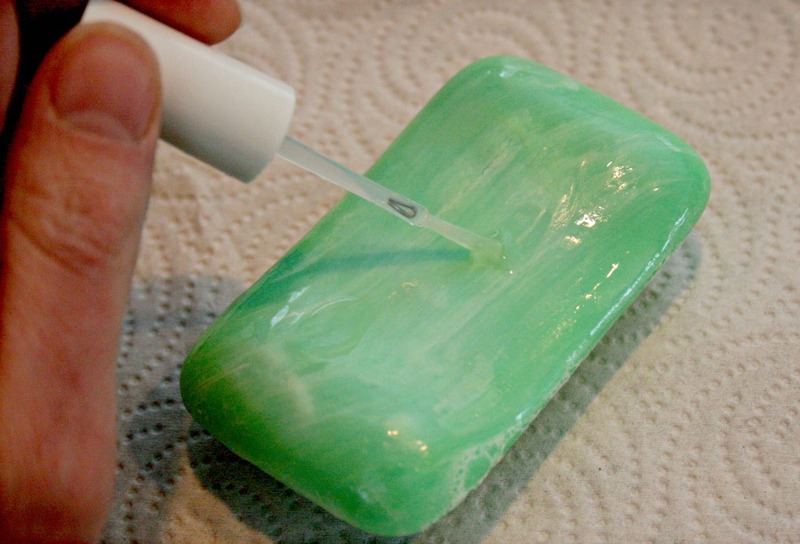 I took his bar of soap, painted it with clear nail polish, and returned it to its spot in the shower; the plan being that it wouldn’t lather when he went to use it. As soon as he came downstairs in the morning Eli asked him about it. Eric’s reaction was, “Yeah, I was not impressed.” So it worked, but apparently he’s just not very fun to prank. Grade: A No sense docking the grade because of a lame reaction. If your kids are school-aged and you pack their lunch, this is a good one to try. I packed his real lunch in an alternate bag, and when my husband dropped Eli off at school, he gave it to the teacher on the sly. When Eli got home I asked about his day and he informed me that he was rather annoyed when he discovered my trick (like father, like son??). As soon as he lifted his lunchbox to bring it to his table for snack time, he knew something was up because it was lighter than usual. 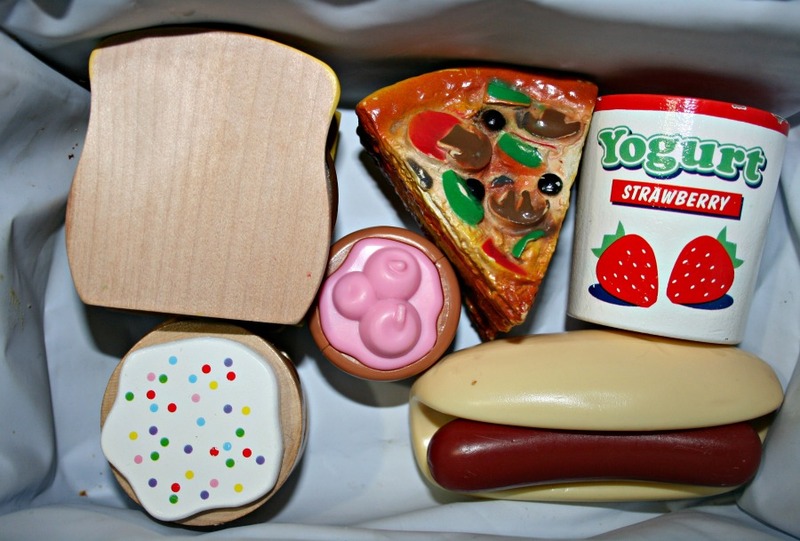 He let out a yell when he opened it and found a bunch of fake food, but his teacher came to the rescue with his real lunch. He claims that she didn’t even think it was funny, but he had a hard time telling me that with a straight face, so I don’t know if I believe him. Grade: B+ This would have been a better prank if I could have been there to see the reaction. Okay, this one was all Eli. He came up with and executed the idea all by himself. 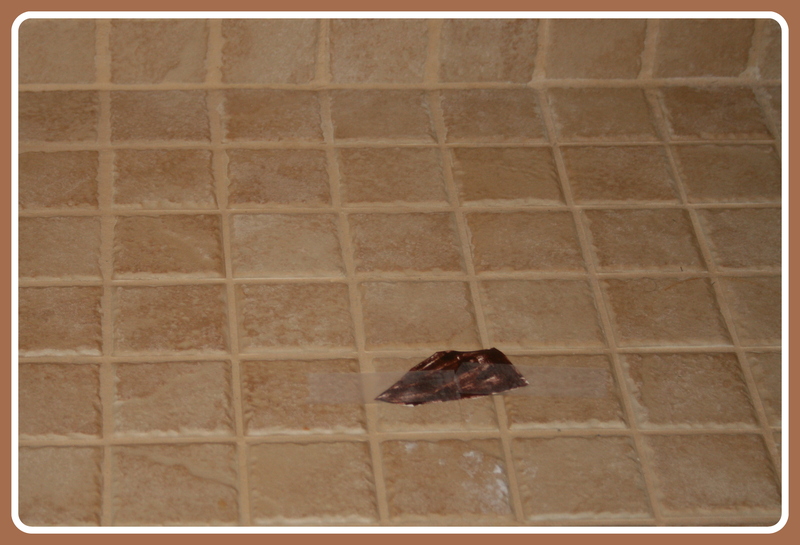 My husband came down the stairs with cries of, “Lauren, we’ve GOT to clean that shower!! There was poop in it!” I’m pretty sure it made Eli’s entire week that he pulled off a prank on his dad. We won’t talk about the fact that my husband made a big deal out of our five-year-old’s prank but totally disregarded mine. Psshhhh. Grade: A Yes we knew it wasn’t real, but he gets an A for effort and cuteness. 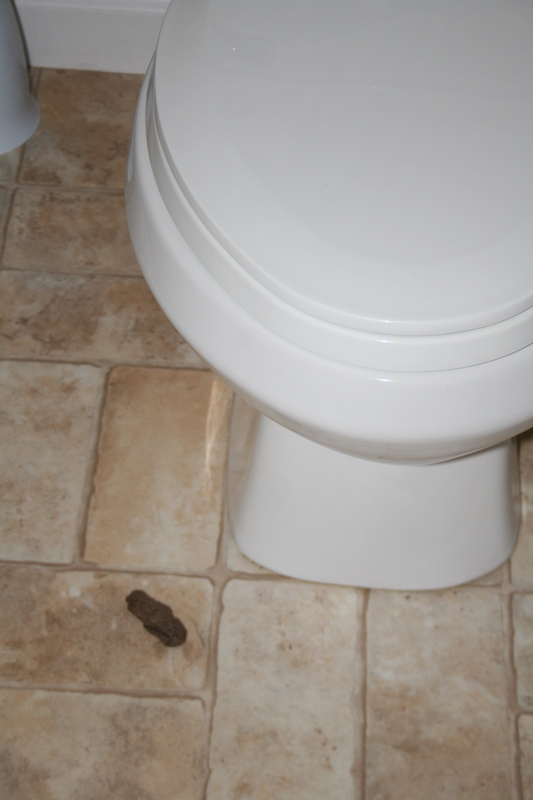 The year after Eli’s “Poop in the Shower” prank, I decided to have a go at the poop prank. I took a toilet paper tube, wet it, and fashioned it into a poop shape. It looked surprisingly real from a distance. I put it near the toilet and waited for someone to notice. The boys both saw it and were fooled momentarily, but quickly caught on. Grade: C This has potential, but needs work. Maybe this year I’ll do what my friend did and create a much more believable concoction out of chocolate sauce, oatmeal, and peanut (or sun) butter. She smeared it on the toilet seat and floor and I’ve got to tell you, it was very convincing. Take a close-up picture of your face. Make sure to include a bit of your hand, waving hello. Print off the picture (8×10!) and tape it to the underside of the toilet seat. Close the lid and wait. I was excited for this one because it looked so funny once I got it set up. The first one to use the bathroom was Samuel. He gave a shout of surprise, so I quickly ran over to see his reaction and quiet him down so it would work on Eli too. When Eli discovered it not long after, he too was surprised, but took his reaction a step too far by deciding to finish what he went in there for. That’s right. He peed. On the picture. That kind of ruined the joke in a hurry, but he quickly learned what a bad choice it was when he was the one who had to clean up the mess. Grade: A- It would probably have gotten an A+ if it hadn’t been for the aftermath. If you have boys and you try this one, you’ve been warned! This one took some planning and I wasn’t sure if it would work. First I had to make the sign big enough and bold enough for people to see. Then I had to figure out a way to get it to stay on the back of my vehicle. Driving to school to pick up the boys was a good test run because I realized that I’d need to use an alternate route home (roads with multiple lanes) in order to maximize our chances of getting honked at. Once at school, my friend helped me devise a plan to have the hatch open so the boys wouldn’t notice the sign when they came outside. It worked, and off we drove. We got a few honks fairly quickly and I tried to keep a straight face as I ‘thought out loud’ about what they could possibly be honking at. Unfortunately, after the fourth or fifth honk, Eli (who had seen this joke somewhere before) figured out what was going on. Even so, it was a funny prank, especially since he was kind of embarrassed about it. Grade: A This is one of my favorites so far. I’d give it an A+, but it’s partially dependent on how other people react, so make sure you’re driving in an area that has the maximum amount of traffic and more than one lane (if there’s only one, the same person will be behind you most of the time and people won’t see your sign). HAVE ANY GREAT PRANK IDEAS FOR ME TO GRADE THIS YEAR? SEND THEM MY WAY (lauren@ohhonestly.net) AND YOU MAY FIND THEM ADDED TO MY LIST NEXT YEAR! Loved your pranks!!!! Our classroom was one prank after another today. Before I left school last night, I inverted all the posters (spelling lists, etc.). I also wrote their assignments upside down on the board (a little tricky to execute) and copied one of their cursive papers backwards. Mid afternoon, I served “brownies” (BROWN E’s) and gave a pop quiz on unknown material with one student accomplice. Overall, it was a great day!! Wow, yours took some time to prepare! It’s fun, isn’t it? Eli is at the perfect age for it; Samuel and Annelise, not so much. In an office: scotch tape the hook down on your co-workers telephones and then call them and watch when their phones ring and they keep saying hello, hello and the phones are still ringing. Very funny to watch. Hahah! That makes me want to work somewhere just so I can try it! Love the Jello “juice” trick! An excuse for the kids to have Jello that day (if not for breakfast). Right? You’d think he would have been excited. Not so much. 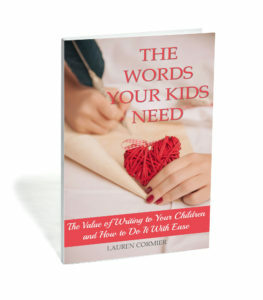 Really cute ideas to do with your family. Thanks for the ideas and sparking my imagination to see what I can pull off next month! I am laughing so hard. I am sure my husband would have the same reaction to the soap. My kid would be bummed about the school lunch (I thought it was funny) and the poop in the shower, just classic, and priceless. I love these ideas. 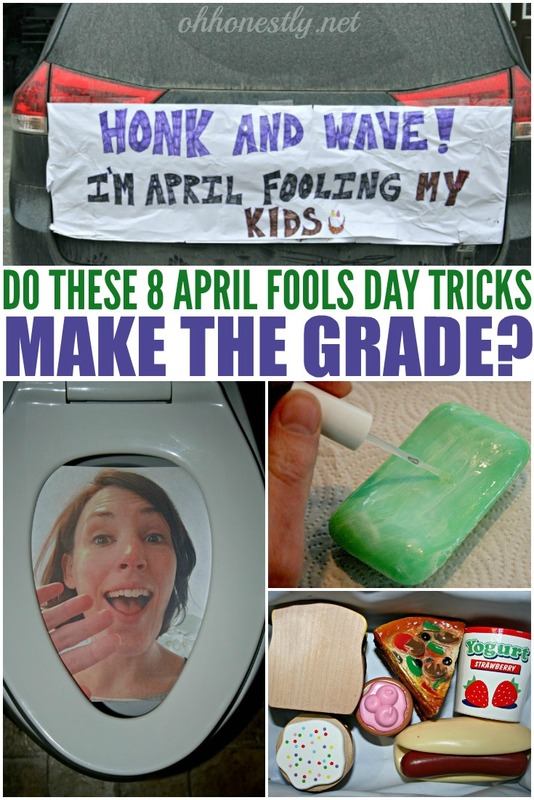 Makes me want to really get my kids this year when April Fools’ Day rolls around! It was definitely fun. I need to come up with some to try out this year. BTW why didn’t your husband clean the shower? #justsayin poop doesn’t discriminate…. These are so funny! I can’t wait to try some of these! Lol I love these. We’ve made fake poop by wetting a toilet paper roll and tearing it to pieces then squeezing it together into a log. We totally got my sister in law when we put in on the kitchen floor. It’s going to be after April fools but I really want to mix in rocks painted as eggs in the yard when we do our egg hunt! give them the chicken pox! all u have to do is dot their face with red maker and wait for their surprised and horror look as they look in the mirror. I love all of your ideas! Thank you!! 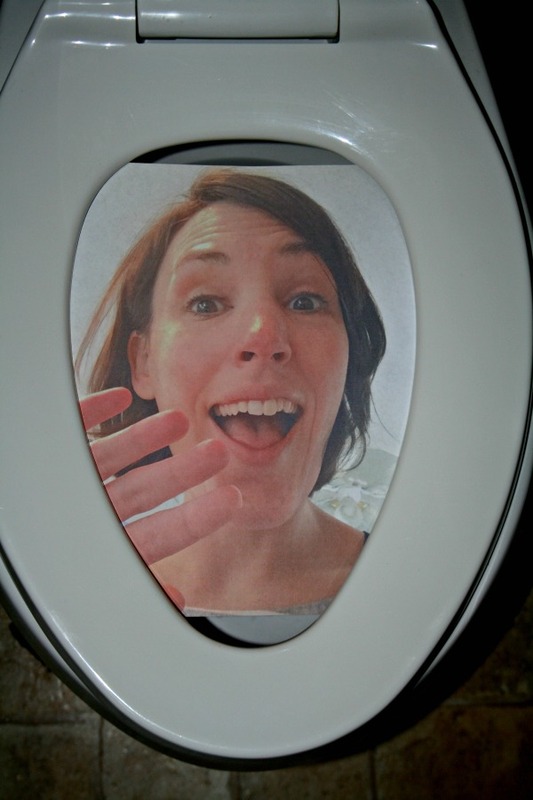 I taped a crazy picture of the face of a well-known Actor on the inside of the lid of the toilet seat – so it would be creepy like he was watching them “go”. Totally freaked the boys out!! It was awesome. We love April fools day here! I have four little girls and they always expect me to do something, so I have to be very sneaky and very creative or I won’t catch them off guard. Also they would much rather have something cute rather than something messy or too surprising! For example, two years ago I got out the Barbie cups and plates and pitcher, purchased cereal that looked like cinnamon buns and Runts fruit-shaped candy. When the kids came down stairs they saw a tiny breakfast on the table, milk in their tiny glasses and pitcher and one tiny cinnamon bun and tiny fruit on each plate. Last year I gave them a giant breakfast. I bought giant platters, serving bowls and huge tumblers from the dollar store. I served donuts as bowls of Cheerios ( with serving spoons), piles of plums as grapes and about half a gallon of milk in each of their tumblers. I’m hoping this year will be easier since it doesn’t all have to be done before school! Thank you for the awesome Easter ideas! last year I put a few pieces of uncooked pasta in a snack bag and used sticky tape to put it under the toilet seat. My husband thought he broke the seat when he sat down.